American lawyer and communal worker; born Sept. 15, 1856, at Victoria, Texas; died in New York Jan. 13, 1904. Destined for a commercial career, Levi was sent to New York to take a commercial course, but manifesting no interest in his father's business, he returned to Victoria in 1871, and in 1872 entered the University of Virginia at Charlottesville, Va., to study law. He won the debater's medal and the essayist's medal in one year. Levi returned, after having finished his studies, to Texas, but being only slightly over twenty years old, he had to resort to proceedings to remove his disabilities so that he could without delay be admitted to the bar. In 1878 Levi stumped the state of Texas on behalf of Gustav Sleicher, who was running for Congress and was elected, defeating Judge Ireland. Although he refused to hold a political office, Levi always took an active interest in public affairs both in Texas and in New York, to which latter state he removed in 1899, establishing a law-office in New York city. His main activity, however, was as a communal worker, especially in his connection with the B'nai B'rith, of which he became president in 1900. 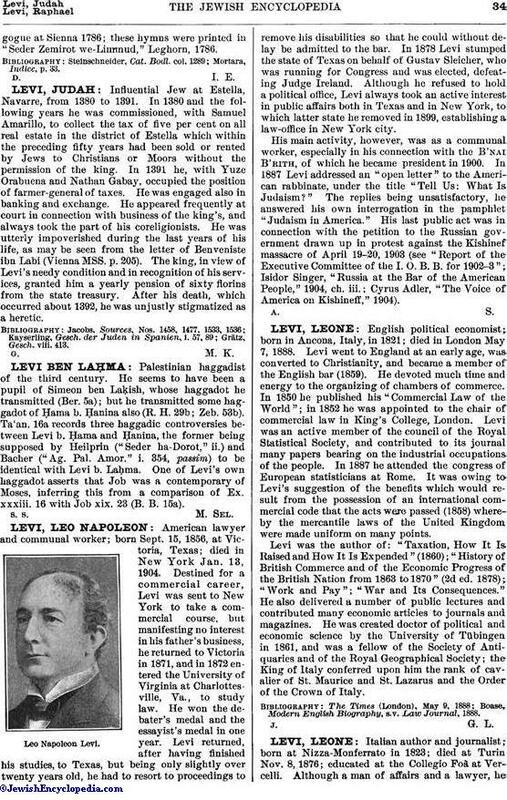 In 1887 Levi addressed an "open letter" to the American rabbinate, under the title "Tell Us: What Is Judaism?" The replies being unsatisfactory, he answered his own interrogation in the pamphlet "Judaism in America." His last public act was in connection with the petition to the Russian government drawn up in protest against the Kishinef massacre of April 19-20, 1903 (see "Report of the Executive Committee of the I. O. B. B. for 1902-3"; Isidor Singer, "Russia at the Bar of the American People," 1904, ch. iii. ; Cyrus Adler, "The Voice of America on Kishineff," 1904).